Sitting in the back pew of a packed church in Fort Greene, Brooklyn, William Jamieson hoped to learn winning tips from a workshop on how to play New York City’s housing lotteries. The lotteries, which the city uses to distribute subsidized apartments in new buildings, can be hard to navigate, and Mr. Jamieson had applications pending for lotteries in two buildings. But surrounded by hundreds of other hopefuls at the church, he was not feeling particularly lucky. “I probably have a better chance playing the Lotto,” said Mr. Jamieson, 46, a warehouse worker who rents a room in a six-bedroom house and was hunting for a studio or a one-bedroom. Last year, a new building in Greenpoint, Brooklyn drew 58,832 lottery applications for 105 affordable units. Not far behind was the Sugar Hill development in Upper Manhattan, which drew more than 48,000 applicants for 98 apartments. And topping both was the drawing this month for 38 units at 59 Frost Street in Williamsburg. With rents ranging from $640 for a studio to $1,395 for a two-bedroom, the Brooklyn property attracted more than 80,000 applications, said Martin Dunn, whose Dunn Development Corporation built the project. That is one unit for every 2,110 applications. “It really shows how desperate the need is for affordable housing,” Mr. Dunn said. As the city tries to address a housing crisis, many New Yorkers are becoming all too familiar with the lotteries used to dole out apartments that poor and working-class residents can afford. Even as such lotteries proliferate in pockets of the city where new mixed-income developments are being built, the odds of going home to the prize are growing longer. That has led some elected officials and tenant advocates to call for changes in the process to account for the record-high demand. “This is a moment when we really have to look at this because we’re about to see probably the greatest use of the lottery system in city history,” City Councilman Mark Levine said. Last year, tenants won 2,500 new apartments through 41 lotteries that drew a total of 1.5 million applications, housing officials said. The lotteries are expected to multiply under Mayor Bill de Blasio’s pledge to produce 80,000 moderately priced apartments over the next 10 years, a goal that, even if reached, would still leave many lottery hopefuls empty-handed. “When you have so many applicants, every concern is magnified because there’s so much at stake,” said Mr. Levine, who said he was drafting a bill to create a task force to examine the lottery system. The city’s Department of Housing Preservation and Development runs the lotteries. 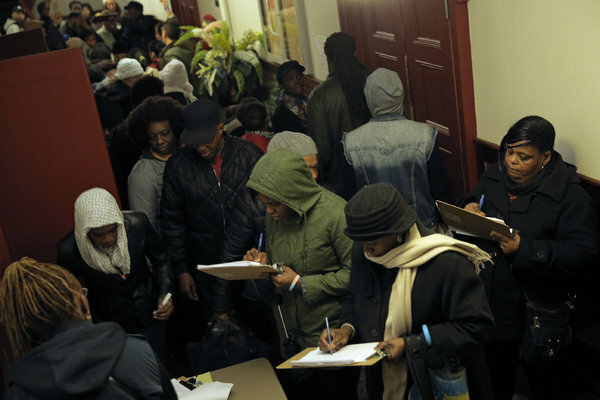 Applicants who secure the lowest numbers in the agency’s random drawings are screened by the developer, which verifies income and interviews candidates until enough eligible households are found to fill the units set aside as affordable. Applications rose substantially in 2013 when the city began accepting them online. NYC Housing Connect, the website listing the open lotteries, currently shows more than 290,000 registered users. Mr. Levine said the experience with the lottery for the Sugar Hill Development, in his Upper Manhattan district, was sobering and raised issues of fairness. Sugar Hill’s developer, the nonprofit organization Broadway Housing Communities, said about three-fourths of the applicants who had been screened were rejected, mostly because their earnings were too low (income requirements ranged from $13,866 to $79,700, depending on the apartment size) or they failed to provide the necessary paperwork. Some missed out by as little as $25 a year, the developer said. “Hundreds of people were excluded for reasons that were not rational,” Ellen Baxter, the executive director of the Broadway Housing Communities, said of the city’s lottery rules. Leigh Lumford, 28, said she applied to the lottery for an apartment in 60 Water Street, a new luxury building in Dumbo, Brooklyn, last March, without a glimmer of hope. But in September, she was notified that she had drawn No. 615 in the lottery. Though only 58 of the 290 apartments there are subsidized, so many people are found to be ineligible or withdraw that No. 615 qualified Ms. Lumford for screening. “Oh, this is amazing,” she recalled thinking at the time. 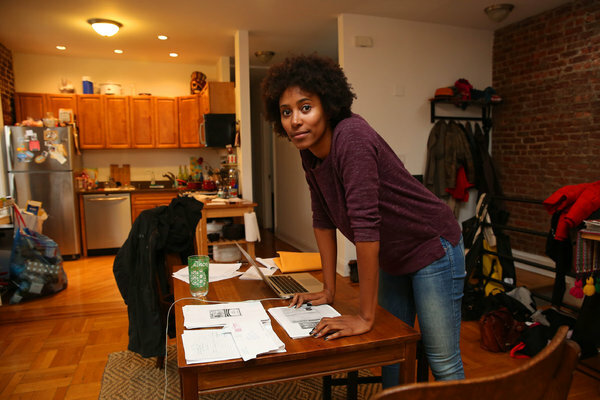 But Ms. Lumford, who shares an apartment with two roommates in Crown Heights, Brooklyn, received a rejection letter in November saying she had surpassed the income requirement for an affordable unit by $3,000 a year. She appealed the decision, and lost, arguing that the screeners miscalculated when reviewing pay stubs from her jobs, some of them paid by the hour, as a yoga teacher in an after-school program, a CPR instructor and a babysitter. “We’re not typically people who have one job,” she said. Some tenant advocates said the developers should relax their standards for creditworthiness and documentation to accommodate the realities of the low-income tenant pool. A bigger issue for some is that eligibility for the new units is restricted to narrow bands of income that often leave out the very poor who need housing the most or applicants like Mr. Jamieson, who earn about $50,000 a year with overtime, too much money for a one-person household to qualify for many of the lotteries. Housing officials said the income restrictions were dictated by the subsidy programs financing the affordable units, which, in turn, depend on the strength of the housing market and the ability to finance new construction projects. An equitable distribution of housing, city officials said, demands that everybody applying for lotteries be treated the same. But the administration recognizes some of the problems. Officials said they were tweaking the city’s housing finance programs to broaden the range of incomes eligible for affordable apartments. And the lottery website, which is in English, will soon be available in six more languages and will include a guidebook with more detailed explanations about income calculations and other guidelines. Increased efficiency would also help developers, who are required to fill the affordable units at the same rate or faster than the market-rate apartments but spend months disqualifying thousands of applicants. In addition to income, they also look for applicants with preferential status — 5 percent of the affordable units are reserved for city employees and as many as half for residents already living in the community where the building will go up, which officials say helps preserve neighborhoods and entices municipal workers to stay in the city. Developers said they had learned to start marketing the apartments early, sometimes years ahead. “It’s somewhat like finding a needle in a haystack,” said Melissa R. Burch, executive vice president for development at Forest City Ratner Companies, which is preparing for the lottery of 2,250 affordable units at Pacific Park Brooklyn, formerly known as Atlantic Yards. While many despair, some dreams come true. 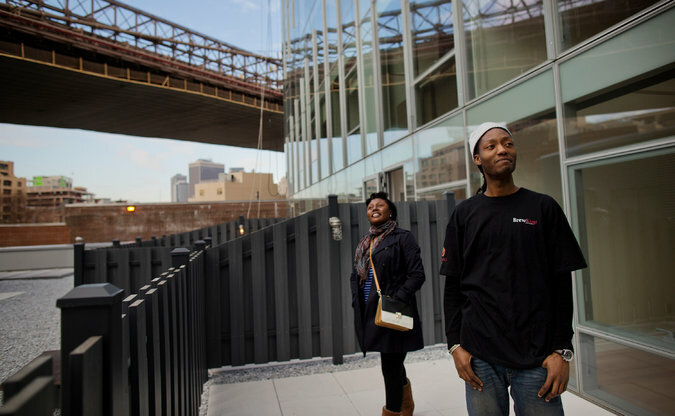 Oluwashina Alaka, 30, a restaurant chef and coffee distributor, recently moved from a studio into a $737-a-month, one-bedroom apartment in the same Dumbo building Ms. Lumford covets. Mr. Alaka agreed that the paperwork was daunting enough to make many people give up, but he advised persistence as the best way to improve one’s chances. A version of this article appears in print on January 30, 2015, on page A1 of the New York edition with the headline: In Lotteries for New York Housing, Long Odds Grow Ever Longer.